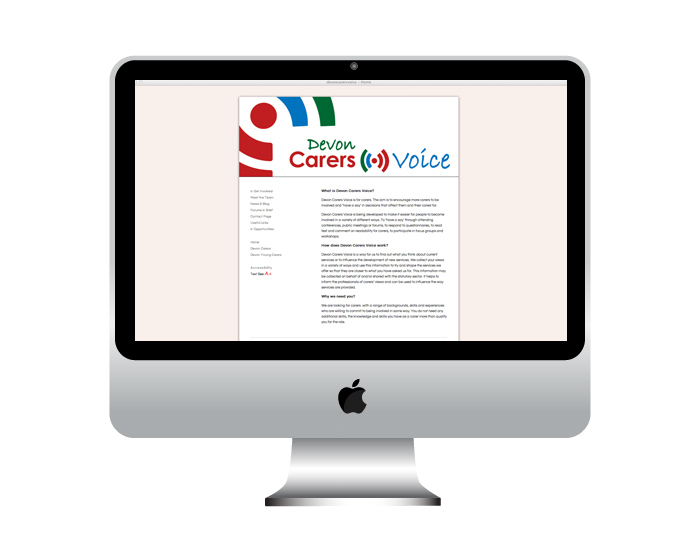 A sub brand of Devon Carers – Devon Carers Voice helps carers have their say. The branding needed to be similar to Devon Carers to tie in with the brand, but also different enough to look like a separate group. I worked with Rachel from Colourclear Graphic Design, who designed the logo, and from there we worked on the branding and ideas for the website. The logo is designed to look like the RSS feed symbol, and like radio waves or sound waves, to emphasise the importance of communication within the organisation. We wanted something very simple that would fit with the existing Devon Carers branding, and that would work well with the existing colours. We used the same colours from the Devon Carers branding as the main colour – Green for Devon (to tie into the Devon County Council branding – one of the partnerships), Red for Carers (as a homage to Carers UK), and then the blue for Voice (to tie in with the NHS branding – another of the partnerships), along with the logo, and used the same typefaces on the website – Bradley Hand for Devon, and Century Gothic for the other words. The typefaces used convey the friendly aspect of the brand, and help it seem approachable. We also used a similar structure and design, to tie in to the Devon Carers branding. The website was built on Squarespace, to enable staff to access the site and change/add content from the admin side easily. The navigation menu on the left hand side is a similar layout to the Devon Carers site, and has links back to this as well, to ensure ease of use for the carers. You can see the website here: Devoncarersvoice.org.uk – as part of the sub brand for Devon Carers, and you can see this project and others on my website here: www.laurapakoradesign.co.uk.